Behavioral modernity is a suite of behavioral and cognitive traits that distinguishes current Homo sapiens from other anatomically modern humans, hominins, and primates. Although often debated, most scholars agree that modern human behavior can be characterized by abstract thinking, planning depth, symbolic behavior (e.g., art, ornamentation), music and dance, exploitation of large game, and blade technology, among others. Underlying these behaviors and technological innovations are cognitive and cultural foundations that have been documented experimentally and ethnographically. Some of these human universal patterns are cumulative cultural adaptation, social norms, language, and extensive help and cooperation beyond close kin. It has been argued that the development of these modern behavioral traits, in combination with the climatic conditions of the Last Glacial Maximum, was largely responsible for the human replacement of Neanderthals and the other species of humans of the rest of the world. Arising from differences in the archaeological record, a debate continues as to whether anatomically modern humans were behaviorally modern as well. There are many theories on the evolution of behavioral modernity. These generally fall into two camps: gradualist and cognitive approaches. The Later Upper Paleolithic Model refers to the theory that modern human behavior arose through cognitive, genetic changes abruptly around 40,000–50,000 years ago. Other models focus on how modern human behavior may have arisen through gradual steps; the archaeological signatures of such behavior only appearing through demographic or subsistence-based changes. To classify what traits should be included in modern human behavior, it is necessary to define behaviors that are universal among living human groups. Some examples of these human universals are abstract thought, planning, trade, cooperative labor, body decoration, control and use of fire. Along with these traits, humans possess much reliance on social learning. This cumulative cultural change or cultural "ratchet" separates human culture from social learning in animals. As well, a reliance on social learning may be responsible in part for humans' rapid adaptation to many environments outside of Africa. Since cultural universals are found in all cultures including some of the most isolated indigenous groups, these traits must have evolved or have been invented in Africa prior to the exodus. Several critiques have been placed against the traditional concept of behavioral modernity, both methodologically and philosophically. Shea (2011) outlines a variety of problems with this concept, arguing instead for "behavioral variability", which, according to the author, better describes the archaeological record. The use of trait lists, according to Shea (2011), runs the risk of taphonomic bias, where some sites may yield more artifacts than others despite similar populations; as well, trait lists can be ambiguous in how behaviors may be empirically recognized in the archaeological record. Shea (2011) in particular cautions that population pressure, cultural change, or optimality models, like those in human behavioral ecology, might better predict changes in tool types or subsistence strategies than a change from "archaic" to "modern" behavior. Some researchers argue that a greater emphasis should be placed on identifying only those artifacts which are unquestionably, or purely, symbolic as a metric for modern human behavior. The Late Upper Paleolithic Model, or Upper Paleolithic Revolution, refers to the idea that, though anatomically modern humans first appear around 150,000 years ago, they were not cognitively or behaviorally "modern" until around 50,000 years ago, leading to their expansion into Europe and Asia. These authors note that traits used as a metric for behavioral modernity do not appear as a package until around 40–50,000 years ago. Klein (1995) specifically describes evidence of fishing, bone shaped as a tool, hearths, significant artifact diversity, and elaborate graves are all absent before this point. Although assemblages before 50,000 years ago show some diversity the only distinctly modern tool assemblages appear in Europe at 48,000. According to these authors, art only becomes common beyond this switching point, signifying a change from archaic to modern humans. Most researchers argue that a neurological or genetic change, perhaps one enabling complex language, such as FOXP2, caused this revolutionary change in our species. Contrasted with this view of a spontaneous leap in cognition among ancient humans, some authors like Alison S. Brooks, primarily working in African archaeology, point to the gradual accumulation of "modern" behaviors, starting well before the 50,000 year benchmark of the Upper Paleolithic Revolution models. Howiesons Poort, Blombos, and other South African archaeological sites, for example, show evidence of marine resource acquisition, trade, the making of bone tools, blade and microlith technology, and abstract ornamentation at least by 80,000 years ago. Given evidence from Africa and the Middle East, a variety of hypotheses have been put forth to describe an earlier, gradual transition from simple to more complex human behavior. Some authors have pushed back the appearance of fully modern behavior to around 80,000 years ago in order to incorporate the South African data. Others focus on the slow accumulation of different technologies and behaviors across time. These researchers describe how anatomically modern humans could have been cognitively the same and what we define as behavioral modernity is just the result of thousands of years of cultural adaptation and learning. D'Errico and others have looked at Neanderthal culture, rather than early human behavior exclusively, for clues into behavioral modernity. Noting that Neanderthal assemblages often portray traits similar to those listed for modern human behavior, researchers stress that the foundations for behavioral modernity may in fact lie deeper in our hominin ancestors. If both modern humans and Neanderthals express abstract art and complex tools then "modern human behavior" cannot be a derived trait for our species. They argue that the original "human revolution" theory reflects a profound Eurocentric bias. Recent archaeological evidence, they argue, proves that humans evolving in Africa some 300,000 or even 400,000 years ago were already becoming cognitively and behaviourally "modern". These features include blade and microlithic technology, bone tools, increased geographic range, specialized hunting, the use of aquatic resources, long distance trade, systematic processing and use of pigment, and art and decoration. These items do not occur suddenly together as predicted by the "human revolution" model, but at sites that are widely separated in space and time. This suggests a gradual assembling of the package of modern human behaviours in Africa, and its later export to other regions of the Old World. Between these extremes is the view – currently supported by archaeologists Chris Henshilwood, Curtis Marean, Ian Watts and others – that there was indeed some kind of 'human revolution' but that it occurred in Africa and spanned tens of thousands of years. The term "revolution" in this context would mean not a sudden mutation but a historical development along the lines of "the industrial revolution" or "the Neolithic revolution". In other words, it was a relatively accelerated process, too rapid for ordinary Darwinian "descent with modification" yet too gradual to be attributed to a single genetic or other sudden event. These archaeologists point in particular to the relatively explosive emergence of ochre crayons and shell necklaces apparently used for cosmetic purposes. These archaeologists see symbolic organisation of human social life as the key transition in modern human evolution. Recently discovered at sites such as Blombos Cave and Pinnacle Point, South Africa, pierced shells, pigments and other striking signs of personal ornamentation have been dated within a time-window of 70,000–160,000 years ago in the African Middle Stone Age, suggesting that the emergence of Homo sapiens coincided, after all, with the transition to modern cognition and behaviour. While viewing the emergence of language as a 'revolutionary' development, this school of thought generally attributes it to cumulative social, cognitive and cultural evolutionary processes as opposed to a single genetic mutation. A further view, taken by archaeologists such as Francesco D'Errico and João Zilhão, is a multi-species perspective arguing that evidence for symbolic culture in the form of utilised pigments and pierced shells are also found in Neanderthal sites, independently of any "modern" human influence. Cultural evolutionary models may also shed light on why although evidence of behavioral modernity exists before 50,000 years ago it is not expressed consistently until that point. With small population sizes, human groups would have been affected by demographic and cultural evolutionary forces that may not have allowed for complex cultural traits. According to some authors until population density became significantly high, complex traits could not have been maintained effectively. It is worth noting that some genetic evidence supports a dramatic increase in population size before human migration out of Africa. High local extinction rates within a population also can significantly decrease the amount of diversity in neutral cultural traits, regardless of cognitive ability. Highly speculatively, bicameral mind theory argues for an additional, and cultural rather than genetic, shift from selfless to self-perceiving forms of human cognition and behavior very late in human history, in the Bronze Age. This is based on a literary analysis of Bronze Age texts which claims to show the first appearances of the concept of self around this time, replacing the voices of gods as the primary form of recorded human cognition. This non-mainstream theory is not widely accepted but does receive serious academic interest from time to time. Before the Out of Africa theory was generally accepted, there was no consensus on where the human species evolved and, consequently, where modern human behavior arose. Now, however, African archaeology has become extremely important in discovering the origins of humanity. Since the first Cro-Magnon expansion into Europe around 48,000 years ago is generally accepted as already "modern", the question becomes whether behavioral modernity appeared in Africa well before 50,000 years ago, as a late Upper Paleolithic "revolution" which prompted migration out of Africa, or arose outside Africa and diffused back. A variety of evidence of abstract imagery, widened subsistence strategies, and other "modern" behaviors have been discovered in Africa, especially South and North Africa. The Blombos Cave site in South Africa, for example, is famous for rectangular slabs of ochre engraved with geometric designs. Using multiple dating techniques, the site was confirmed to be around 77,000 years old. Beads and other personal ornamentation have been found from Morocco which might be as much as 130,000 years old; as well, the Cave of Hearths in South Africa has yielded a number of beads significantly before 50,000 years ago. Specialized projectile weapons as well have been found at various sites in Middle Stone Age Africa, including bone and stone arrowheads at South African sites such as Sibudu Cave (along with an early bone needle found at Sibudu) dating approximately 60,000-70,000 years ago, and bone harpoons at the Central African site of Katanda dating ca. 90,000 years ago. Evidence also exists for the systematic heat treating of silcrete stone to increased its flake-ability for the purpose of toolmaking, beginning approximately 164,000 years ago at the South African site of Pinnacle Point and becoming common there for the creation of microlithic tools at ca. 72,000 years ago. In 2008, an ochre processing workshop likely for the production of paints was uncovered dating to ca. 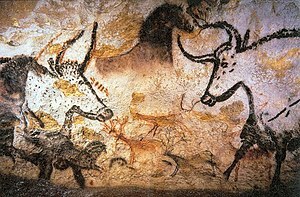 100,000 bc at Blombos Cave, South Africa. Analysis shows that a liquefied pigment-rich mixture was produced and stored in the two abalone shells, and that ochre, bone, charcoal, grindstones and hammer-stones also formed a composite part of the toolkits. Evidence for the complexity of the task includes procuring and combining raw materials from various sources (implying they had a mental template of the process they would follow), possibly using pyrotechnology to facilitate fat extraction from bone, using a probable recipe to produce the compound, and the use of shell containers for mixing and storage for later use. Modern behaviors, such as the making of shell beads, bone tools and arrows, and the use of ochre pigment, are evident at a Kenyan site by 78,000-67,000 years ago. The oldest known stone-tipped projectile weapons (a characteristic tool of homo sapiens), the stone tips of javelins or throwing spears, are known from the Ethiopian site of Gademotta, and date to ca. 279,000 years ago. Expanding subsistence strategies beyond big-game hunting and the consequential diversity in tool types has been noted as signs of behavioral modernity. A number of South African sites have shown an early reliance on aquatic resources from fish to shellfish. Pinnacle Point, in particular, shows exploitation of marine resources as early as 120,000 years ago, perhaps in response to more arid conditions inland. Establishing a reliance on predictable shellfish deposits, for example, could reduce mobility and facilitate complex social systems and symbolic behavior. Blombos Cave and Site 440 in Sudan both show evidence of fishing as well. Taphonomic change in fish skeletons from Blombos Cave have been interpreted as capture of live fish, clearly an intentional human behavior. Humans in North Africa (Nazlet Sabaha, Egypt) are known to have dabbled in chert mining, as early as ≈100,000 years ago, for the construction of stone tools. While traditionally described as evidence for the later Upper Paleolithic Model, European archaeology has shown that the issue is more complex. A variety of stone tool technologies are present at the time of human expansion into Europe and show evidence of modern behavior. Despite the problems of conflating specific tools with cultural groups, the Aurignacian tool complex, for example, is generally taken as a purely modern human signature. The discovery of "transitional" complexes, like "proto-Aurignacian", have been taken as evidence of human groups progressing through "steps of innovation". If, as this might suggest, human groups were already migrating into eastern Europe around 40,000 years and only afterward show evidence of behavioral modernity, then either the cognitive change must have diffused back into Africa or was already present before migration. In light of a growing body of evidence of Neanderthal culture and tool complexes some researchers have put forth a "multiple species model" for behavioral modernity. Neanderthals were often cited as being an evolutionary dead-end, apish cousins who were less advanced than their human contemporaries. Personal ornaments were relegated as trinkets or poor imitations compared to the cave art produced by H. sapiens. Despite this, European evidence has shown a variety of personal ornaments and artistic artifacts produced by Neanderthals; for example, the Neanderthal site of Grotte du Renne has produced grooved bear, wolf, and fox incisors, ochre and other symbolic artifacts. Although burials are few and controversial, there has been circumstantial evidence of Neanderthal ritual burials. There are two options to describe this symbolic behavior among Neanderthals: they copied cultural traits from arriving modern humans or they had their own cultural traditions comparative with behavioral modernity. If they just copied cultural traditions, which is debated by several authors, they still possessed the capacity for complex culture described by behavioral modernity. As discussed above, if Neanderthals also were "behaviorally modern" then it cannot be a species-specific derived trait. Most debates surrounding behavioral modernity have been focused on Africa or Europe but an increasing amount of focus has been placed on East Asia. This region offers a unique opportunity to test hypotheses of multi-regionalism, replacement, and demographic effects. Unlike Europe, where initial migration occurred around 50,000 years ago, human remains have been dated in China to around 100,000 years ago. This early evidence of human expansion calls into question behavioral modernity as an impetus for migration. Stone tool technology is particularly of interest in East Asia. Following Homo erectus migrations out of Africa, Acheulean technology never seems to appear beyond present-day India and into China. Analogously, Mode 3, or Levallois technology, is not apparent in China following later hominin dispersals. This lack of more advanced technology has been explained by serial founder effects and low population densities out of Africa. Although tool complexes comparative to Europe are missing or fragmentary, other archaeological evidence shows behavioral modernity. For example, the peopling of the Japanese archipelago offers an opportunity to investigate the early use of watercraft. Although one site, Kanedori in Honshu, does suggest the use of watercraft as early as 84,000 years ago, there is no other evidence of hominins in Japan until 50,000 years ago. The Zhoukoudian cave system near Beijing has been excavated since the 1930s and has yielded precious data on early human behavior in East Asia. Although disputed, there is evidence of possible human burials and interred remains in the cave dated to around 34-20,000 years ago. These remains have associated personal ornaments in the form of beads and worked shell, suggesting symbolic behavior. Along with possible burials, numerous other symbolic objects like punctured animal teeth and beads, some dyed in red ochre, have all been found at Zhoukoudian. Although fragmentary, the archaeological record of eastern Asia shows evidence of behavioral modernity before 50,000 years ago but, like the African record, it is not fully apparent until that time. ^ a b c d e f g McBrearty, Sally; Brooks, Allison (2000). "The revolution that wasn't: a new interpretation of the origin of modern human behavior". Journal of Human Evolution. 39 (5): 453–563. doi:10.1006/jhev.2000.0435. PMID 11102266. ^ a b c d e f g h Henshilwood, Christopher; Marean, Curtis (2003). "The Origin of Modern Human Behavior: Critique of the Models and Their Test Implications". Current Anthropology. 44 (5): 627–651. doi:10.1086/377665. ^ Hill, Kim; et al. (2009). "The Emergence of Human Uniqueness: Characters Underlying Behavioral Modernity". Evolutionary Anthropology. 18 (5): 187–200. CiteSeerX 10.1.1.469.5702. doi:10.1002/evan.20224. ^ Klein, R. G. 1999. The human career: human biological and cultural origins. Chicago: University of Chicago Press. ^ a b c d D'Errico, F; et al. (1998). "Neanderthal Acculturation in Western Europe? A Critical Review of the Evidence and Its Interpretation". Current Anthropology. 39 (S1): S1–S44. doi:10.1086/204689. ^ a b c d e f g Klein, Richard (1995). "Anatomy, behavior, and modern human origins". Journal of World Prehistory. 9 (2): 167–198. doi:10.1007/bf02221838. ^ a b c Marean, Curtis; et al. (2007). "Early human use of marine resources and pigment in South Africa during the Middle Pleistocene". Nature. 449 (7164): 905–908. Bibcode:2007Natur.449..905M. doi:10.1038/nature06204. PMID 17943129. ^ a b c Powell, Adam; et al. (2009). "Late Pleistocene Demography and the Appearance of Modern Human Behavior". Science. 324 (5932): 1298–1301. Bibcode:2009Sci...324.1298P. doi:10.1126/science.1170165. PMID 19498164. ^ a b c Premo, Luke; Kuhn, Steve (2010). "Modeling Effects of Local Extinctions on Culture Change and Diversity in the Paleolithic". PLOS ONE. 5 (12): e15582. Bibcode:2010PLoSO...515582P. doi:10.1371/journal.pone.0015582. PMC 3003693. PMID 21179418. ^ a b Boyd, Robert; Richerson, Peter (1988). Culture and the Evolutionary Process (2 ed.). University of Chicago Press. ISBN 9780226069333. ^ a b Nakahashi, Wataru (2013). "Evolution of improvement and cumulative culture". Theoretical Population Biology. 83: 30–38. doi:10.1016/j.tpb.2012.11.001. PMID 23153511. ^ Wade, Nicholas (2003-07-15). "leap to language". New York Times. Retrieved 2009-09-10. ^ Buller, David (2005). Adapting Minds: Evolutionary Psychology and the Persistent Quest for Human Nature. PMIT Press. p. 468. ISBN 978-0-262-02579-9. ^ "80,000-year-old Beads Shed Light on Early Culture". Livescience.com. 2007-06-18. Retrieved 2009-09-10. ^ "three distinct human populations". Accessexcellence.org. Retrieved 2009-09-10. ^ a b c d Shea, John (2011). "Homo sapiens Is as Homo sapiens Was". Current Anthropology. 52 (1): 1–35. doi:10.1086/658067. ^ a b c Hoffecker, John (2009). "The spread of modern humans in Europe". PNAS. 106 (38): 16040–16045. Bibcode:2009PNAS..10616040H. doi:10.1073/pnas.0903446106. PMC 2752585. PMID 19571003. ^ a b c Tattersall, Ian (2009). "Human origins: Out of Africa". PNAS. 106 (38): 16018–16021. Bibcode:2009PNAS..10616018T. doi:10.1073/pnas.0903207106. PMC 2752574. PMID 19805256. ^ a b Foley, Robert; Lahr, Marta (1997). "Mode 3 Technologies and the Evolution of Modern Humans". Cambridge Archaeological Journal. 7 (1): 3–36. doi:10.1017/s0959774300001451. ^ a b c d D'Errico, Francesco (2003). "The Invisible Frontier A Multiple Species Model for the Origin of Behavioral Modernity". Evolutionary Anthropology. 12 (4): 188–202. doi:10.1002/evan.10113. ^ Henshilwood, C. S.; d'Errico, F.; Yates, R.; Jacobs, Z.; Tribolo, C.; Duller, G. A. T.; Mercier, N.; Sealy, J. C.; Valladas, H.; Watts, I.; Wintle, A. G. (2002). "Emergence of modern human behavior: Middle Stone Age engravings from South Africa". Science. 295 (5558): 1278–1280. Bibcode:2002Sci...295.1278H. doi:10.1126/science.1067575. PMID 11786608. ^ Henshilwood, C.; Marean, C. W. (2003). "The origin of modern human behavior". Current Anthropology. 44 (5): 627–651. doi:10.1086/377665. ^ Watts, I. 2009. Red ochre, body painting, and language: interpreting the Blombos ochre. In R. Botha and C. Knight (eds), The Cradle of Language. Oxford: Oxford University Press, pp. 62-92. ^ Mellars, P. A., K. Boyle, O. Bar-Yosef and C. Stringer (eds), 2007. Rethinking the Human Revolution: new behavioural and biological perspectives on the origin and dispersal of modern humans. Cambridge: McDonald Institute for Archaeological Research. ^ Henshilwood, C. S. and B. Dubreuil 2009. Reading the artifacts: gleaning language skills from the Middle Stone Age in southern Africa. In R. Botha and C. Knight (eds), The Cradle of Language. Oxford: Oxford University Press, pp. 41-61. ^ Botha, R. and C. Knight (eds), The Cradle of Language. Oxford: Oxford University Press. ^ D'Errico, F (2003). "The invisible frontier: a multiple species model for the origin of behavioral modernity". Evolutionary Anthropology. 12 (4): 188–202. doi:10.1002/evan.10113. ^ Zilhão, J (2006). "Neandertals and moderns mixed, and it matters". Evolutionary Anthropology. 15 (5): 183–195. doi:10.1002/evan.20110. ^ Henshilwood, Christopher; et al. (2002). "Emergence of Modern Human Behavior: Middle Stone Age Engravings from South Africa". Science. 295 (5558): 1278–1280. Bibcode:2002Sci...295.1278H. doi:10.1126/science.1067575. PMID 11786608. ^ Blackwell, Lucinda (2008). "Middle Stone Age bone tools from the Howiesons Poort layers, Sibudu Cave, South Africa". Journal of Archaeological Science. 35. ^ Wadley, Lyn (2008). "The Howieson's Poort industry of Sibudu Cave". South African Archaeological Society Goodwin Series. 10. ^ Yellen, JE; AS Brooks; E Cornelissen; MJ Mehlman; K Stewart (28 April 1995). "A middle stone age worked bone industry from Katanda, Upper Semliki Valley, Zaire". Science. 268 (5210): 553–556. doi:10.1126/science.7725100. PMID 7725100. ^ Sahle, Y.; Hutchings, W. K.; Braun, D. R.; Sealy, J. C.; Morgan, L. E.; Negash, A.; Atnafu, B. (2013). Petraglia, Michael D (ed.). "Earliest Stone-Tipped Projectiles from the Ethiopian Rift Date to >279,000 Years Ago". PLoS ONE. 8 (11): e78092. doi:10.1371/journal.pone.0078092. PMC 3827237. PMID 24236011. ^ Guinness World Records (10 September 2015). Guinness World Records 2016. Guinness World Records. p. 27. ISBN 978-1-910561-03-4. ^ a b Joris, Olaf; Street, Martin (2008). "At the end of the 14C time scaledthe Middle to Upper Paleolithic record of western Eurasia". Journal of Human Evolution. 55 (5): 782–802. doi:10.1016/j.jhevol.2008.04.002. PMID 18930513. ^ Anikovich, M.; et al. (2007). "Early Upper Paleolithic in Eastern Europe and Implications for the Dispersal of Modern Humans". Science. 315 (5809): 223–226. Bibcode:2007Sci...315..223A. doi:10.1126/science.1133376. PMID 17218523. ^ a b Abadia, Oscar Moro; Gonzalez Morales, Manuel R. (2010). "REDEFINING NEANDERTHALS AND ART: AN ALTERNATIVE INTERPRETATION OF THE MULTIPLE SPECIES MODEL FOR THE ORIGIN OF BEHAVIOURAL MODERNITY". Oxford Journal of Archaeology. 29 (3): 229–243. doi:10.1111/j.1468-0092.2010.00346.x. ^ a b c d Norton, Christopher; Jin, Jennie (2009). "The Evolution of Modern Human Behavior in East Asia: Current Perspectives". Evolutionary Anthropology. 18 (6): 247–260. doi:10.1002/evan.20235. ^ Liu, Wu; et al. (2010). "Human remains from Zhirendong, South China, and modern human emergence in East Asia". PNAS. 107 (45): 19201–19206. Bibcode:2010PNAS..10719201L. doi:10.1073/pnas.1014386107. PMC 2984215. PMID 20974952. ^ Norton, Christopher; Bae, K. (2008). "The Movius Line sensu lato (Norton et al. 2006) further assessed and defined". Journal of Human Evolution. 55 (6): 1148–1150. doi:10.1016/j.jhevol.2008.08.003. PMID 18809202. ^ Lycett, Stephen; Norton, Christopher (2010). "A demographic model for Palaeolithic technological evolution: The case of East Asia and the Movius Line". Quaternary International. 211 (1–2): 55–65. Bibcode:2010QuInt.211...55L. doi:10.1016/j.quaint.2008.12.001. Steven Mithen (1999), The Prehistory of the Mind: The Cognitive Origins of Art, Religion and Science, Thames & Hudson, ISBN 978-0-500-28100-0.